The new building in Mulberry, Florida incorporates state-of-the-art laboratory facilities to support ArrMaz operations and customers worldwide. This new Innovation Center will allow us to continue to attract great scientific minds to ArrMaz and to Polk County, Florida, while enabling us to innovate further and provide even more responsive support to our customers worldwide. 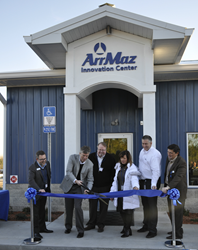 On January 18th, ArrMaz celebrated the opening of its new, state-of-the-art ArrMaz Innovation Center. The ribbon-cutting ceremony was hosted by the Central Florida Development Council with Commissioner Todd Dantzler, Chairman of the Polk County Board of County Commissioners, and key community and business leaders in attendance. The completion of the ArrMaz Innovation Center coincides with ArrMaz’s 50th anniversary, reinforcing the company’s ongoing commitment to innovation and to helping its customers succeed. The ArrMaz Innovation Center is located at ArrMaz headquarters in Mulberry, Florida, and was designed to house the company’s research and development team. The facility incorporates a modern work environment with cutting-edge laboratory equipment for analytical and synthetic chemistry to support ArrMaz laboratory operations and customers across the globe. The building’s layout is based on an open laboratory concept with separate scientific disciplines now co-located and sharing resources to foster scientific collaboration, team-based research and ground-breaking innovation by ArrMaz scientists. The facility also features expansive glass windows between offices and labs to maximize light while providing open sight lines for improved safety, and flexible engineering systems to facilitate future phased expansion plans. “Mulberry, Florida is not only our headquarters but it is also our hub for global innovation. This new Innovation Center will allow us to continue to attract great scientific minds to ArrMaz and to Polk County, Florida, while enabling us to innovate further and provide even more responsive support to our customers worldwide,” said Dave Keselica, Chief Executive Officer, ArrMaz. The ArrMaz Innovation Center is just another example of how ArrMaz cultivates a commitment to customer success and to relentless improvement, key principles fundamental to the ArrMaz Way. ArrMaz is a global leader in the production of specialty chemicals for the mining, fertilizer, asphalt, industrial ammonium nitrate, and oil and gas industries worldwide. Since 1967, ArrMaz has formulated chemical process aids and additives to optimize our customers’ process performance and product quality. With headquarters in Mulberry, Florida and multiple locations across North and South America, Europe, Asia, Africa and the Middle East, ArrMaz serves customers in more than 70 countries worldwide. For more information about our company and products, visit us online at ArrMaz.com. The Central Florida Development Council (CFDC) is Polk County, Florida’s Economic Development Partnership, designated by the Polk County Board of County Commissioners. The CFDC is responsible for recruiting new businesses to Polk County and helping existing businesses expand. Polk County is located between the Tampa and Orlando metro areas in Central Florida and includes 17 municipalities. For more information, visit cfdc.org.